1.1 Not Necessarily a Conventional Television! The wait is finally over with NVidia unveiling its first television that primarily focuses on gaming. While we cannot blame the company for this inclination, the BFGD monitor is a holistic option for the gamers and even the entertainment-enthusiastic individuals. To be precise, accessing this BFGD monitor or rather television promises high levels of gaming performance followed by low latency gaming experience. Moreover, this TV from NVidia debunks a myth that massive TVs aren’t conducive to high-end gaming. Put simply, BFGD from NVidia assumes a sizeable real-estate of 65-inches and comes forth with a world of possibilities. 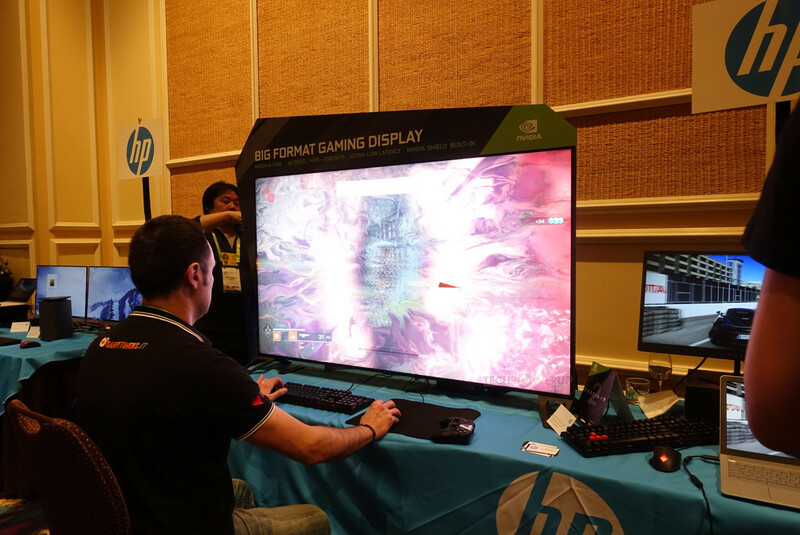 Nvidia launched G-Sync technology based BFGD (Big Format Gaming Displays) Television at CES 2018. Not Necessarily a Conventional Television! NVidia’s BFGD television deploys the functional ‘G-Sync’ technology that makes use of varied refresh rates for synchronizing gameplay frame rates. This feature minimizes the stutters and overall display tearing. As claimed by NVidia, the BFGD monitor promises immersive gaming experience— clubbed with tear-free, smooth and responsive performances. From a more technical standpoint, the G-Sync technology shows up in certain PC monitors. And it offers similar levels of ‘ultra-low latency’— a feature that avoids frame drops and facilities exceptional gaming. While it’s important to connect the BFGD module to PCs with NVidia graphics card compatibility via the Display port connection, the variable rate issue can be best solved by the HDMI 2.1 connector which surprisingly isn’t available on NVidia’s BFGD television. The HDMI 2.0b connection is quite decent but the lack of HDMI 2.1 support might impair the big-screen gaming performances to a considerable extent. According to NVidia, the BFGD television offers a native refresh rate of 120Hz which is way better than any other 65-inch television in the market. In addition to that, HDR or High Dynamic Range is supported followed by local dimming support and 4K display resolution. As there isn’t a dedicated TV tuner onboard, over-the-air broadcasts are currently unsupported. Besides the enviable display prowess, the BFGD television from NVidia also flaunts the utilitarian NVidia Shield. This feature encompasses the gaming and streaming goodness of Android TVs, clubbed with Google Assistant. Basically, the Shield from NVidia is an extremely powerful streamer, offering NAS access, Kodi support, HomeRun Integration, Plex Server functionality and even streaming capabilities for 4K HDR. The company claims to have bundled the game controller and NVidia Shield remote with the television followed by a bespoke addition of the far-field microphone that offers Google Assistant compatibility. With Shield on-board, BFGD’s frame rate gets a substantial boost, precisely for the 25FPS format. This aspect facilitates exceptional video rendering. For the global industry watchers, it is important to analyze the existing technologies associated with the NVidia BFGD television. To begin with, this device offers HDR computability for myriad video sources. Unlike most television sets which map down the HDR content with low brightness, the BFGD module actually offers High Dynamic Range with Direct Backlit-LED console to amplify the viewing experience. The DCI-P3 gamut is comparable to some high-end television, retailing in the market. Moreover, this device offers 4K display resolution which was probably expected considering the hype around its reveal. The full-array, local dimming capabilities add to the credibility of this television. However, NVidia hasn’t actually enlisted the number of existing dimmable zones but the viewing experience is claimed to be exemplary. Apart from that, NVidia comes forth with the VA LCD module which offers better levels of contrast as compared to the IPS LCDs. However, the Dolby Vision misses out and instead we get the HDR10 with this monitor. At present, we don’t have an actual release date regarding the BFGD monitor. However, NVidia will start entering the market via its partnered firms like HP, Acer, and Asus which will assist the former with the entire retail process. Tentatively, we can expect the official launch sometime in summer.